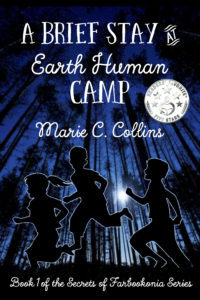 What are readers saying about A Brief Stay at Earth Human Camp? • Apple devices: Get the Kindle app for your device from the AppStore. • Android and PC: Search “free Kindle app” on Amazon.com. Thanks! Your comment will display after it's reviewed. Your blog is fantastic. Thanks. Thank you to Double Decker Books for hosting my two-week blog tour! During the tour, posts about A Brief Stay at Earth Human Camp will appear on Double Decker Books every other day. In addition, each of the bloggers listed below will post about A Brief Stay at Earth Human Camp during the tour on the dates shown. 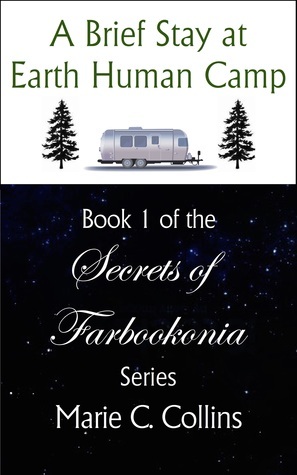 Along with information about the book, individual posts may include reviews, an author interview, a character interview with Maylin (Anne’s bunkmate at camp), and Maylin’s Top-20 Vintage Sci-Fi Watch List (which she promised she’d send Anne after camp). Links in the list will be updated as each post goes live. So … after I published my last post — the one about TeenBookReviewer’s review of A Brief Stay at Earth Human Camp — I got to thinking: What DOES it take to motivate a teenager to be a book blogger in his/her “spare” time?! Fortunately, TBR was willing to fill me in. 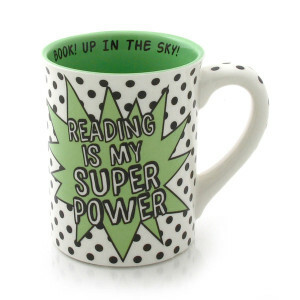 If you’re just catching up, TeenBookReviewer is an anonymous U.K. teen who blogs about books. Welcome, TBR! TBR: I’m glad to be here! Me: If I’m seeing this correctly, this summer will mark two years that you’ve been blogging. Is that right? TBR: Yes, you are correct. However, I am going to celebrate the 17th September as my first year of blogging because it was on this date last year that I truly became serious about the blog and started blogging properly. Me: What does it take to be a teenage book blogger? I mean, how did other things in your life have to shift to make room for this kind of pastime? Did you have to give up any other activities to do it? 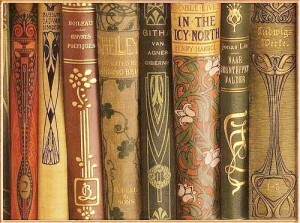 TBR: I’ll admit it does take a certain person to be a teenage book blogger. It takes a persevering person, a person willing to sacrifice time and effort. It’s a difficult thing, but I have to admit that it was the best decision I made, and it’s very rewarding. I didn’t have to give up any other activities, no. You don’t have to give up anything as long as you take a little time to make sure your blogging fits around you and your lifestyle. Me: How did your friends and family react to you being a book blogger? TBR: My friends and family were actually very supportive. I knew my family would be, of course; I’ve always loved books so it wasn’t that surprising and they’re very supportive of everything I do. I thought my friends might take a little less of an open-minded approach, but I was wrong. They were just as excited as I was, which was fantastic and gave me the confidence I needed to get started. Me: What is the most surprising thing you learned about life/the world/people as a result of being a book blogger? TBR: Wow, what a good question! 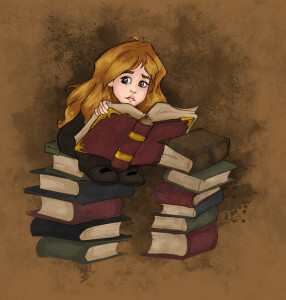 I suppose I learned that books are nothing without people. Without the reader, a novel is but ink on a page. I learned that people are what make books important. They are so much more than entertainment. They are beautiful, and they makes dreams and imagination. Me: That’s quite an insight. You’re right, of course — if a book fell in the forest … What have you learned about yourself as a result of being a book blogger? TBR: From being a book blogger? I would say I learned that I am much more organized than I thought. I learned that I can do whatever I want to do. I can tell people what I think about something and have people take is as more than just the opinion of some random person they don’t know! Me: What a great thing to learn. Save that paragraph, TBR. It belongs somewhere on your college applications. What have you found to be the hardest part of being a book blogger? And how about the most rewarding? TBR: The hardest part is probably making sure things are reviewed as quickly as possible, and that scheduled posts go out on time, no matter what. That’s what I mean by perseverance; I’ve only missed one post before, and I’ve been known to post when I’ve been sick. The most rewarding part is seeing the reactions of the authors and the readers to the reviews, definitely! Me: What would you do differently if you were starting your blog today? TBR: If I were starting the blog today I would definitely read up more, looking at advice of other bloggers, before starting my own. I would certainly have researched about blog creation a lot more so I made a strong start in the blogging world! Me: What advice would you give another teen who was starting a blog today? TBR: I would tell any other teen starting a blog that it is honestly the most rewarding thing. I would say to not give up and keep going, even if you find it hard to keep going. Even if you feel that you aren’t getting rewards, I promise you are and that you’ll see them if you just keep going. There were times when I felt like I just wasn’t doing well enough with the blog, because I made the mistake of comparing my blog to others. Never do that, because nothing good can come of comparing yourself to others. Me: How has reading and writing for your blog impacted the reading and writing you do for school? TBR: Well, it’s done quite a lot for me actually. I have improved a lot at feeling more confident with critical writing and analysis, and I can read books more objectively if I need to, like I do for reviews. I would say it has actually impacted my reading and writing a lot, albeit in lots of small ways. To be honest, there isn’t much that I feel that the blog hasn’t benefited me in, it’s great! Me: On your blog you say you started TeenBookReviewer because you wanted to be a journalist, but elsewhere on the site you hint that that’s changed. What do you see as your future profession now? And has blogging played any role in that change? TBR: Yes, I did start the blog because I wanted to be a journalist. And yes, that has changed. I would love to be an archaeologist, a goal I am working towards. I know it’s a far cry from what I do in book reviews, but my love of archeology is just as much a part of me as my love of reading is. No, blogging hasn’t actually played any role in that change, it was all just part of a personal growth and a realization of what I truly want to do. Me: How exciting! Considering how much you love to read, do you ever see yourself writing a novel? TBR: Oh yes, quite frequently actually. I would love to write a novel, it’s something I have dreamed about doing for a long time. But I have a small problem with my writing; I will begin to write an idea and enjoy writing it, however when I look back on it a day or so later, I hate it and get rid of the idea. I can never really get beyond about 2000 words and it is sometimes quite discouraging. Me: That’s exactly what it’s like to write a novel, TBR. Some parts come easily, while others require more thought and planning. But beware of the harsh voice in your head that makes you throw things away. It’s not always trustworthy. I go through something similar when I tell someone what I’m working on. Instead of throwing it away, ask yourself what it needs to work better — how you can improve it. Is there anything else you would like to share? 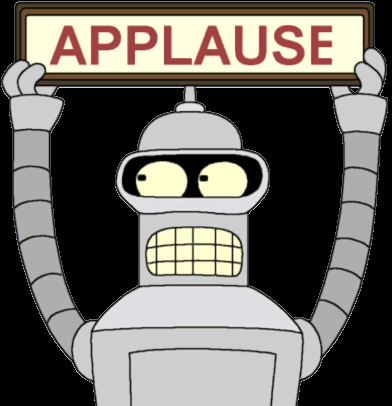 TBR: Yes, I would just like to leave a little note of encouragement to anyone thinking of making a blog. I promise you, if you love what you blog about, it will be the best and most rewarding decision you will ever make. It is incredible, and a completely beautiful experience. Me: Thanks for taking the time to share your experiences as a blogger, TBR! 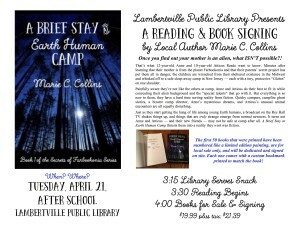 TBR: Thanks for having me, Marie. Remember, you can read TBR’s book reviews on his/her blog. While you’re there, check out TBR’s new “About Me” page, which gives a great sense of who TBR is without revealing his/her gender or identity. Post a comment to let TBR know what an amazing teen s/he is. 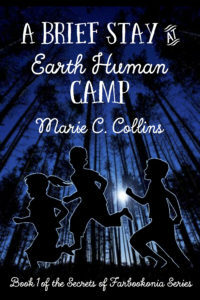 A Brief Stay at Earth Human Camp has been reviewed by a handful of readers since its release a few months ago. I’ve enjoyed every one of them — they all reinforce my credibility as an indie author, and I can’t emphasize enough how important that is. But Sunday I got an email from an anonymous UK blogger who goes by “TeenBookReviewer,” saying s/he had published a review of my book on his/her website. TBR agreed to read the book in March, but review requests often take this long to come to fruition. TBR’s assessment of A Brief Stay at Earth Human Camp is special to me because it was written by someone in my target audience who loves to read. To people who write for adults, that may seem strange, but it’s harder to get reviews from the upper-middle-grade/young-YA readers my book is targeted to than it is to elicit them from older readers. Think about it: Between the academic demands of school, extracurricular activities, friends, and family, it’s a rare breed of young reader who is willing (1) to take on what some might see as “extra work,” and (2) to place his/her opinions under a public spotlight. And yet, these are the reviewers who matter most to me as a writer. 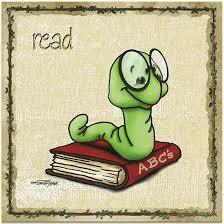 They are the readers I write for. This was a wonderful — and flattering — review for any writer to receive! I felt a similar boost when a good friend’s then-15-year-old daughter read and loved my book. It’s really quite gratifying to connect with any reader. But I think TBR’s anonymity gives his/her review another level of credibility. TBR is an unbiased reviewer of mostly YA books. I am grateful to have gotten a spot in his/her busy queue. The first thing I can say about this book is that, particularly at the beginning, the novel has the feel of the work of Dr. Seuss or Roald Dahl. The similarities really are impressive, and it really made me think that the book really was going to remain that light-hearted. At the beginning, the book feels amusing and light-hearted. Then it starts getting progressively more ominous. There are small climaxes everywhere, and more and more mystery builds. It is a race against time for Atticus and Anne, and a race against themselves. Throughout the novel, the children are trying to discover new things about our society and how to fit into it, at the same time as learning more about themselves and the increasingly dark events at the camp. Collins did a spectacular job on this novel, and it is really something that I would recommend for teens. Don’t let the synopsis make you feel like it is too young for you, because I honestly thought it fit into the YA genre very well. It was an incredible book, one that makes me very excited to read the rest of the series. I commend Marie Collins on her spectacular work on this novel, one which makes you feel the stormclouds gather as you prepare for the storm. You can read more of TBR’s book reviews on the blog s/he maintains. While you’re there, post a comment or two as a way of letting TBR know how amazing it is that s/he does this. TBR’s goal in writing YA reviews may initially have been to connect with other teens. But in doing so, TBR now also hobnobs with writers and publishers and supercharges his/her own writerly skills on a daily basis. It’s coming up soon! On April 21, I’ll be doing my first reading and book signing at the Lambertville Public Library — right here in my cozy little home town. What could be nicer? 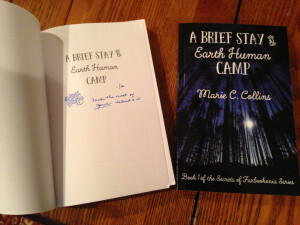 This weekend, I had so much fun pre-inscribing 50 copies of A Brief Stay at Earth Human Camp! I will dedicate and sign them on site, but I wanted to stamp them here to avoid dealing with the ink pad at the library (I have a rubber stamp that says “Greetings, Earthlings”!). I also numbered them like a limited edition, only to be sold locally, because I wanted this first lot to be special. I chose a blue fine-point Sharpie and blue ColorBox ink pad to match the color of the Book 1 cover (just because that’s how I roll). And I just got an email that the blue friendship bracelets I ordered as a camp-themed giveaway have shipped. Fingers crossed that they arrive by Tuesday as I thought of them a little late (thank you, Maureen Smyth!). Yesterday I delivered the flyers below to area schools. 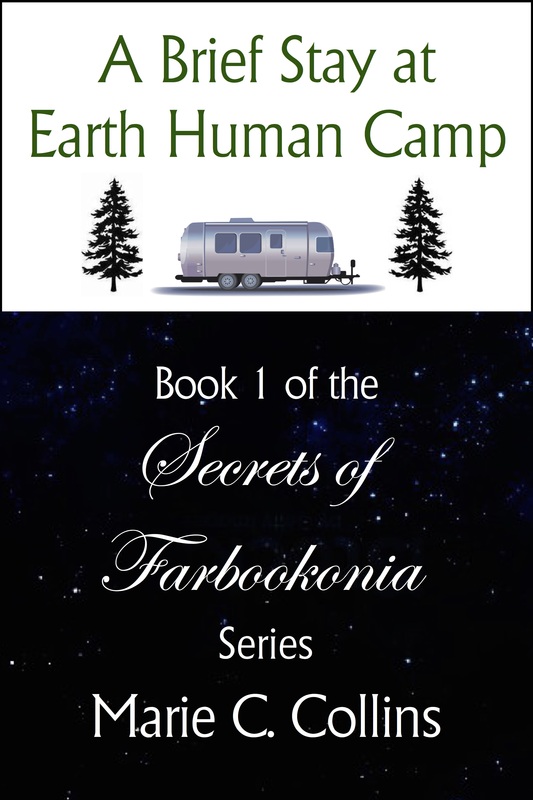 If you enjoyed A Brief Stay at Earth Human Camp and are looking forward to my next book, there are a number of ways you can let me know. Feel free to choose several! But because I am an indie author, one of the best ways to share your enjoyment with me is to write a review on my Amazon book page. But first, I want to tell you why I am suggesting this. It’s a fact: Your reviews and other word-of-mouth recommendations influence what others choose to read more than anything else does. Did you know that? That’s powerful. Your thoughts matter. And from my point of view, if good reviews help new readers find my book, it means I can spend more time writing book two, The Quest for Normal. Hopefully, we both see that as a win-win! Here’s all it takes: On a piece of scrap paper or the computer, jot down a few of the things you liked best about A Brief Stay at Earth Human Camp — certain characters? the camp? part of the story? something else? 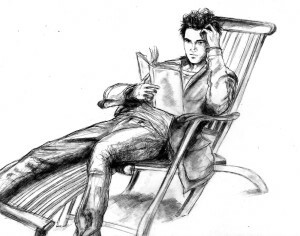 Next, jot down how you felt while you were reading — were you curious? tense? did you feel like you were there (or wanted to be)? There are no right answers here. Now imagine you want to tell a friend what you liked. Using your notes, write your thoughts into the sentences you would use. Voilà! The heavy lifting is DONE — if you want it to be, that is. There are no limits on what you can include in a review. You can write as little or as much as you like. But the more you expect from yourself, the more it may begin to feel like “work,” and the harder it may be to finish. Log in to Amazon and go to my book page. Click a star rating for the book (it’s like a grade), then type or paste your review into the box. Review your review. Since you’re writing for people you don’t know, think about whether you included enough details for a stranger to understand your thoughts. Make any changes you think are needed. If your review reveals something other readers might prefer to find out while reading, put *Spoilers! * at the beginning to help them decide whether or not to read it. Give your review a title that captures how you feel about the book. That’s it! 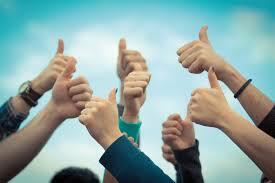 Pat yourself on the back for doing a good deed for an indie author. Reviewers, please share your own additional tips in the comments! Cheryl Carpinello likes to write for what she calls “reluctant readers.” Now that I have read Sons of the Sphinx, she can add “reluctant historians” to her calling card. While I have always loved to read, history (with the exception of biography) has consistently put me to sleep. I did not nap while reading Sons of the Sphinx. The book’s endearing main character, Rosa, helped bring me into the story. She is a reluctant heroine who struggles against her own gifts as well as against being chosen to help the historical characters, King Tut and Ankhesesnamun, reunite. Rosa’s reactions to the things happening around her often made me smile. She is an unworldly 15-year-old who shows a precocious understanding of history early in the story. It is through her appreciative eyes that I was able to see Carpinello’s well-rendered Egyptian landscape and the historically informed details of a glorious city that no longer exists. Early in the story, when we see some of the prized possessions related to ancient Egypt that Rosa keeps in her bedroom, I could not help imagining a young Carpinello storing similar items on her own shelves at one time. On one hand, the fact that Rosa “sees dead people” provided the author an opportunity to tell an engaging story through the eyes of someone who sees things no one else can. On the other, what is history but the ability to see dead people? When seen this way, I think it’s safe to say that this at least is a characteristic Carpinello shares with Rosa. When I was young enough to be considered the target-age of this book, I was superficially intrigued by the Egyptian pyramids, the tombs within them, and mummification. In the late 1970s, I saw the exhibition of artifacts from KingTut’s tomb at the New York Metropolitan Museum of Art. But the details of this period never spoke to me in stories like they do to Rosa or Carpinello. In fact, they didn’t speak to me this way until Sons of the Sphinx. Reading this book motivated me to explore other resources to see where fact and fiction part ways in Sons of the Sphinx. After gleaning that Carpinello made the absolute most of the little that is known of what actually happened, I found myself yawning over these and rereading parts of her book instead. This reluctant historian will stick with Carpinello’s view of events. I highly recommend the book. 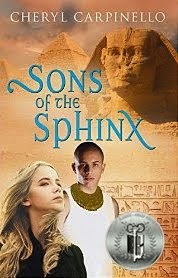 Click here for the Sons of the Sphinx Amazon listing. But something had gone wrong. Terribly wrong. What was to have been a standard ten-day survival test had suddenly become an indefinite life-or-death nightmare. I was stunned to find that this book is NOT dated in the egregious ways that so much other vintage sci fi is (i.e., sexist, racist). To my delight, it features three strong female characters and — judging by surnames only — a multinational cast of characters. This is a pet peeve of mine — I prefer that authors NOT gratuitously mention skin color but am okay with other cues — so I was doubly pleased. Plus the story is first rate. It makes use of space travel via what seem to be wormholes (though Heinlein calls the portals “gates” and “tunnels”). And the “what if” scenario is very compelling. The story is dated in some minor ways. Heinlein makes heavier use of narrative in some areas than you are wont to find in current books in the age category, for instance, though what he has to say is relevant. And of course, some of the dialogue reflects its gosh-oh-gee 1955 origins — but not to a degree that would put off readers today, in my opinion, probably because the very legitimate survival issues the characters are dealing with are so interesting that these bits of dialogue become only superficially distracting. Also, the characters Heinlein creates show he clearly respects young people’s intellects and decision-making abilities, and perhaps this also helps makes the book a good read 60 years after it was written. As I mentioned, the storyline invites comparison with Lord of the Flies — which I thought about several times while reading the book. 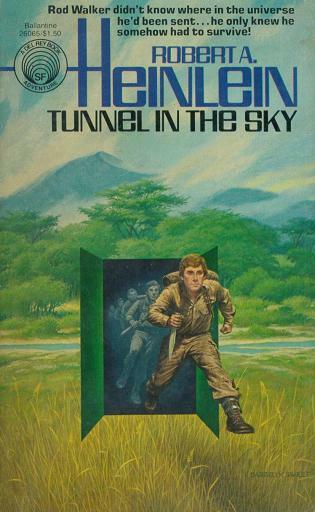 Since Lord of the Flies was published only a year before Tunnel in the Sky, this is likely not an accident — especially when you consider how differently Heinlein’s tale goes. I not saying more on this, to avoid spoilers, but reading the books together would make for interesting discussion based on a side-by-side comparison. After reading the book, I did some digging on Heinlein’s multicultural cast. As it turns out, due to associations some readers make while reading Tunnel in the Sky, Heinlein’s widow was eventually asked whether her late husband had intended the main character of the book, Rod Walker, to be black (see footnote 70 of this Wikipedia entry). 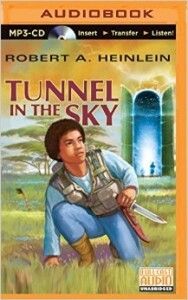 She confirmed that he did, and as a way of honoring this recognition, an audio version of the book was produced in 2011 with a cover that depicts Rod as Heinlein intended. 2011! Readers, to my eye, this detail captures in an astonishing way the slow eradication of race bias in our culture. In 1955, this forward-thinking author envisioned a multicultural future and carried the vision throughout the story by giving intelligence, strength, skill, and leadership to ALL of his young creations. In fact, the footnote I point to above states that the most telling cue to Rod’s race in the story is the fact that other characters seem to subtly pair Rod with another character, Caroline, who is more tellingly dark-skinned. However, Heinlein himself does not pair them! He explicitly states that Caroline is interested in another character. Neither Heinlein’s vision, nor his standing as a best-selling author, impacted the marketing of this book by the publishing industry of his time. Others either could not recognize the relevance of these details, or worse, actively tried to bury them — perhaps due to their own beliefs or what they thought the American public would accept. The original cover slapped on the book erases what Heinlein had the courage to see — both in what it depicts and what it omits. Let that be a lesson about judging books by their covers! I have always admired Heinlein, but he officially just became my favorite sci-fi author of all time. Note: As it turns out, Heinlein actually wrote 13 novels for young adults (his output makes my head spin!). Acc. to Wikipedia, “[H]e embarked on a series of juvenile S.F. 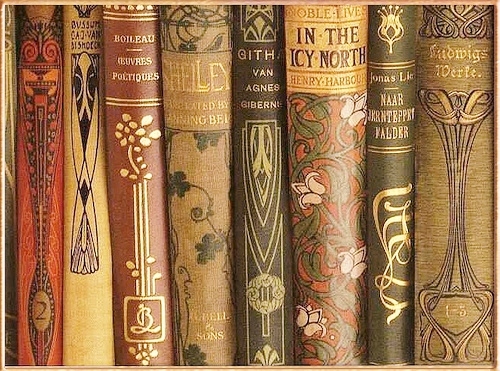 novels for the Charles Scribner’s Sons publishing company that went from 1947 through 1959, at the rate of one book each autumn, in time for Christmas presents to teenagers.” The books are known as the “Heinlein Juveniles” and are sometimes numbered, but the numbering is not meant to suggest a series. Looks like I’m going to have to read them all! By all means, give Tunnel in the Sky a read and let me know what you think! Are you a Heinlein fan? Who’s your favorite sci-fi author? I’m Hosting a GoodReads Giveaway! 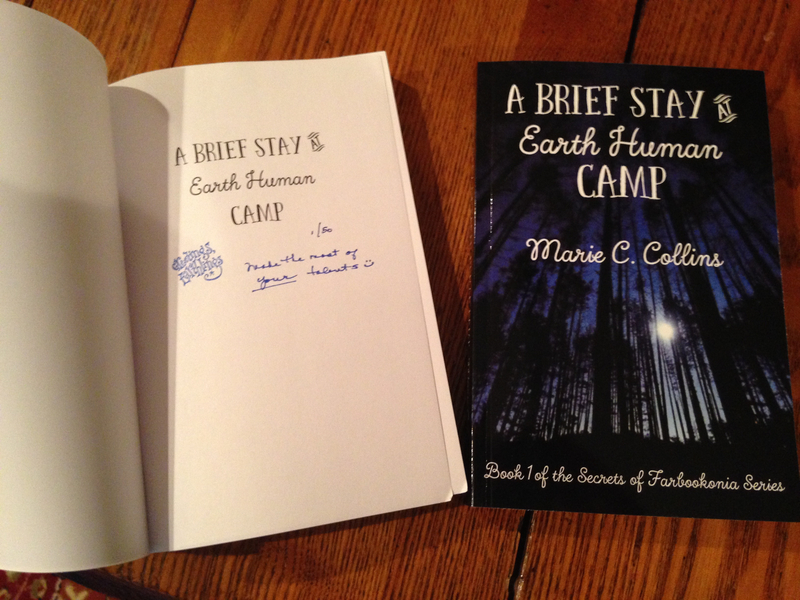 I’m hosting a GoodReads giveaway to celebrate the release of A Brief Stay at Earth Human Camp as a paperback! I hope you’ll enter! And I hope you win! The winner will be announced on my birthday, March 13 (a delicious Friday the 13th this year). To enter, you must be a registered GoodReads member, you must be signed in, and you must be a resident of the USA. Click “Enter to Win,” below, to jump right to the entry form. Friday the 13th eBook Launch! Let the Official eLaunch Begin! 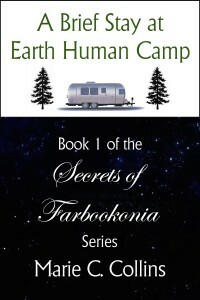 I’ve spent the last few weeks planning the official Kindle eLaunch of A Brief Stay at Earth Human Camp. There’s a lot going on in my world at the moment! Fair warning: If you are connected to me on social media, you are going to see quite a bit of me this week! 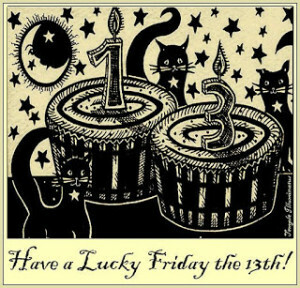 But before I go into the details, let me ask you this: Do you think I’m courting bad luck (or maybe just a little crazy) for scheduling an ebook launch on Friday the 13th? Fear not! I was born on a 13th (3/13, to be exact) — in a blizzard, but that’s another story — so I’ve always felt the need to own these so-called unlucky Fridays. In fact, I like to call on 13s wherever and whenever possible, then dare bad luck to land on my doorstep! From my point of view, the availability of a Friday the 13th for my ebook launch was a harbinger of good luck! I know I’m not alone in this relationship to 13s. If you feel this way too, please tell me why in the comments. 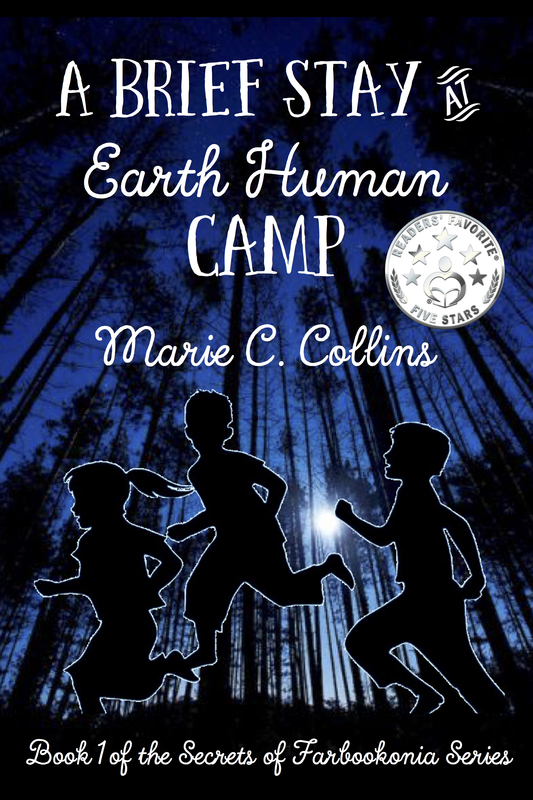 A Brief Stay at Earth Human Camp will also be featured on Kindle Nation Daily’s “Kids Corner” this week — a special part of the Kindle-book website that is reserved exclusively for children’s, middle-grade, and young adult ebooks. Kids Corner is a real asset to both parents of young readers and the indie authors who write for them. If you haven’t seen it, check it out: KND Kids Corner. If you’re already a KND subscriber, you may see my book in your KND and Book Gorilla emails. If any of you feels the urge to help me by sharing or retweeting my posts when you see them — or by stopping by at GoodReads to post a question — I give you my heartfelt thanks in advance! And who knows, maybe a little of my lucky 13 status will rub off on you too! Please don’t go without posting a comment for me! I love hearing from readers and writers alike. 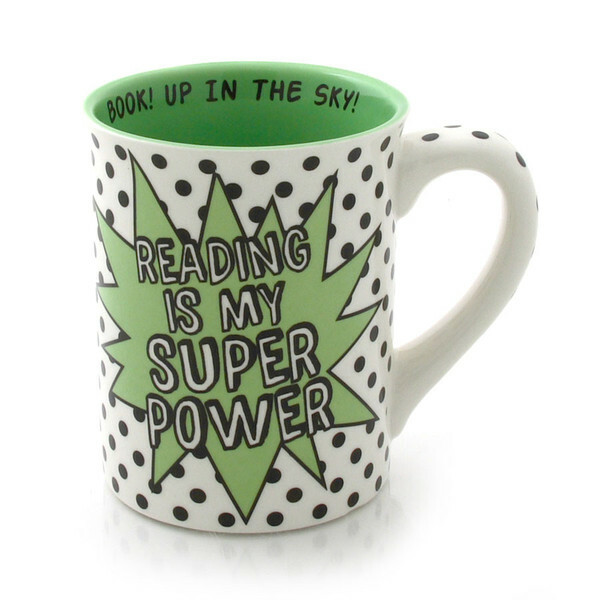 Subscribe to learn about giveaways, new posts, new books & more. Content © Marie C. Collins 2013 | Powered by WordPress.